The Secretary-General of the Council of Ministers, Dr. Mahdi Al-Alaq, chaired the meeting of the Coordination Committee and the management of government activity towards the establishment of electronic governance, attended by a number of relevant authorities. The Secretary-General noted during the meeting that the government curriculum launched by the Prime Minister included clear signals to the e-government and the need to apply them, and that timetables were set for each of the activities of the program, referring to the uncles sent to the ministries in this regard. 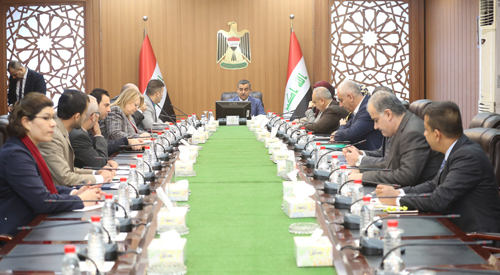 During the meeting, several topics were discussed, the most important of which is the working mechanism of the committees and their work plan for 2019, the decisions of the Council of Ministers on the work of the eGovernment Committee, their follow-up and implementation, the challenges of implementing the Cabinet Decision 387 of 2018, The achievements of the unified card, and the hosting of the card and passport manufacturing plant. The participants highlighted the most important obstacles and problems facing the work. A number of key points were made regarding the progress of work and the results achieved during the past period, and ways to improve the working mechanism to provide the best services to citizens in this regard.